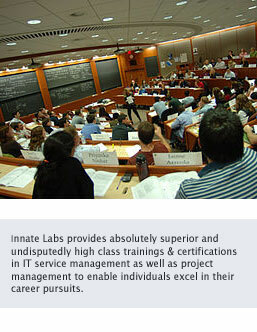 Innate Labs instructors are absolutely superior and undisputedly the best in the market. Our instructors and consultants are practicing/working professionals with over 15 years of experience in the subjects for which they impart training or consulting. They are outstanding masters in their subject matter, however, the prime differentiator is their excellent mentoring skills. Every Innate Labs instructor undergoes rigourous training to learn the best techniques to present knowledge, coach, and create dynamic presentations that bring the classroom to life. Our talented instructors engage participants and pass their expertise on to them with practical, hands-on skills they can use immediately to solve the challenges they face heads on. Because our instructors undergo a meticulous selection and training process before they can undertake a training workshop, participants rate the average Innate Labs instructor with a grade of 4.85 on a 5.00 rating scale. Innate Labs is an accredited organization accredited by AXELOS - UK & PeopleCert. With offices in Mumbai, Bangalore, New Delhi & Vadodara you benefit from the consistent, high quality, services we provide globally, and our tailored solutions that meet specific needs. Innate Labs has successfully trained and certified about 400,000+ participants across various IT and management programs through high quality training delivery and operational excellence. With pan india presence across major industrial & technological hubs including mumbai, bangalore and delhi, we are delivering excellence through our unique learning delivery model and instructors par brilliance. Our first concern is to ensure participants receive consistent quality training. So our focus on quality stems from our desire to ensure all participants receive the best training available, anywhere in the world. Innate Labs acknowledges that in a rapidly changing market, training organizations need to consistently develop alternative mechanisms to deliver training. We have adapted our delivery models to allow for e-learning, instructor-led classroom, virtual learning as well as blended modes of imparting training as well as certifications to our participants/delegates. Innate Labs undertakes a comprehensive and detailed review of all training material to ensure that it meets the requirement of the syllabus. We provide premium high quality reference courseware for all our training, certification & consulting workshops. Innate Labs training model represents the strength and commitment towards imparting quality and high-class learning which most can only dream of, yet you can be rest assured of our competitive pricing structure making trainings, certifications and other services affordable. Our specialized testing practice is build upon in-depth knowledge acquired from delivering value to major corporations across a wide range of industries. We have a proven business and technical expertise in software testing spanning functionality testing, consulting and specialized testing services. Innate Labs is one of the early adopters of ITIL based IT Service Management and one of the first organization to offer ITIL based consultancy. Innate Labs uses an innovative and collaborative approach towards implementing ITSM best practices for clients. We are excited to help you achieve service management excellence. We are always willing to engage with people who are subject matter experts in their field and have that passion to deliver knowledge selflessly. If you have similar traits and can demonstrate what it takes to deliver world-class learning experience, we would like to work with you. Becoming an elite trainer at Innate Labs will not only provide you the opportunity to impart your knowledge and experience in an effective way, but will also impart world class benefits including best-in-class compensation, engaging with the accredited communities, participate in internal working group with leading qualification scheme owners, access to latest happenings and insights as well as continual development prospects to advance in your respective field. If the above details excite you to be part of the enthusiastic and dynamic elite trainer group (ETG) at Innate Labs, please drop us your latest curriculum vitae covering your experience in the subject area of expertise at support@innatelabs.com and we would be glad to have you engaged with us. Innate Labs is a high end IT services, training and consulting organization providing IT services, training and consulting in the field of software quality assurance & testing, software development methodologies, process improvement, Service management and project management. 28K+ Trainings conducted and 400K+ professionals certified worldwide. AXELOS is a joint venture company, created in 2013 by the Cabinet Office on behalf of Her Majesty’s Government (HMG) in the United Kingdom and Capita plc, to manage, develop and grow the Global Best Practice portfolio. AXELOS boasts an already enviable track record and an unmatched portfolio of globally recognized best practice qualifications..
EXIN is an initiative of the Ministry of Economic Affairs - Netherlands. Established in 1984, EXIN went on to produce various IT standards, such as the ITIL®, PRINCE2® and ISPL and now is the world's leading provider of independent information management certification and accreditation. EXIN has been providing the certification and accreditation services in these fields for more than 30 years now. PeopleCert is a leading Examination Institute which accredits training and consulting organizations, and manages certification schemes for professionals. PeopleCert is a global leader in the assessment and certification of professional skills, partnering with multi-national organisations and government bodies to develop and deliver market leading exams worldwide..
ISTQB is an International Testing Qualifications Board established in 2002. The board is responsible for the "ISTQB Certified Tester". "It not only helped me to achieve ITIL certification but also provided me the practical insights to improve my day to day work and help my organization achieve ISO 20000." "The course was really good in terms of facility, faculty and materials provided. Faculty was able to explain all our questions in detail to understand ITIL concepts thoroughly which helped in clearing the ITIL certification exam with ease." "Trainer is very good and he has lot of patience to clear all the doubts and having a good command over the topic too. My special thanks to Innate Labs team to help us get the most valued certification in IT Service management - ITIL from OGC, UK. Scored 98% in the exam. It not only helped me to clear the exam but also provided me the practical insights to improve my day to day work and help my organization achieve ISO 20000." "I was skeptical about this course and certification as to whether it would actually add value to my career or not. Attended the course last month and I am amazed by the knowledge points as well as best practices I have learnt. It helped me to clear the ITIL exam too with 95%." "I am extremely happy for doing ITIL course in Innate Labs. It was a 2 day knowledgeable journey with you. Before I joined Innate Labs Training , I didn't had much knowledge about ITIL stream and even Innate Labs. But after I started to learn this course, I definitely gained much more knowledge than I had expected. " I am pleased by the exemplary knowledge and practices I have came across in this training workshop conducted by Innate Labs. Becoming a foundation level certified ITIL professional (87%) provided me with a accelerated career growth in my current organization too." The content, pace and place of the PRINCE2 course were just the best. I learnt a lot in terms of actually managing projects in real life situations. Of course, certification has given me an edge when it comes to vertical growth within my organization. Thank you Innate Labs. The interactive sessions and real life case studies have actually added much more value then the expectations. 10/10 to Innate Labs PRINCE2 program & certification. I am pleased by the exemplary knowledge of the trainer as well as the content and deliverables of the PRINCE2 program. I would surely recommend Innate Labs for PRINCE2 training & certification. Excellent program, adept trainer & most valued certification in project management. I am impressed by the delivery methodology of Innate Labs and of course, the knowledge & skill of the trainer. Thank you very much for helping me get certified in PRINCE2 Practitioner. Innate Labs is the best way to encourage your career as a tester. I have gained good knowledge on testing by getting trained here. Definitely helping me to build my career in software testing. Innate Labs is the best Institute where you can get qualitative knowledge of software testing. Placement cell also helped me to fetch a job in good company as a tester. Innate Labs is an excellent institute for learning software testing, good environment. They guide us in our career. And I am happy to join Innate Labs. Innate Labs is an excellent institute for software testing with intelligent faculties which gives us wide knowledge on testing. Innate Labs becomes very helpful to make my basis for starting career in software testing and I am very thankful to Innate Labs for it’s guidance and for helping me out to become a software tester. I had already prepared for PMP but never got time to appear for the exam. I wanted to go for a concise training on PMP which would gear me up again for the PMP certification. Innate Labs' PMP Swift program just did that. A 2-day classroom training plus e-learning support enabled me to appear and clear the exam. I am extremely thankful to Innate Labs. Innate Labs approach to training on PMP is quite unique and flexible. The blended learning approach i.e. a mix of Instructor led training & E-learning modules provides reference and guidance even after the classroom sessions, which is tremendously helpful. I was a bit afraid about PMP examiniation due to high cost of examination and wanted just the best training & guidance to ensure that I clear the certification in Ist attempt. Innate Labs just did that and I am now a certified PMP. Thanks again! CMMI®, Capability Maturity Model®, Capability Maturity Modeling®, CMM® and Carnegie Mellon® are registered in the US Patent and Trademark Office by Carnegie Mellon University. ITIL® is a Registered Trade Mark of Axelos Limited - UK. Used under permission of Axelos. All rights reserved, ICTP, ICTA and ICQA are service marks of Innate Labs Private Limited. COBIT is a registered trade mark of ISACA and the IT Governance Institute (ITGI). PRINCE2® is a Registered Trade Mark of Axelos Limited - UK. Used under permission of Axelos. All rights reserved.The Swirl logo™ is a Trade Mark of Axelos Limited - UK. Test Maturity Model and TMM® are the service marks of Illinois Institute of Technology. TMMi ® is the registered trademark of the TMMi®Foundation. "PMI", "PMP", the PMI logo, the PMI Registered Education Provider Logo, "PMBOK", "PgMP"are the registered marks of Project Management Institute, Inc.
Today, Innate Labs serves a wide variety of setups and acts as a common platform providing knowledge programs, competency building and corroboration through training, consulting, certification and benchmarking. Innate Labs focuses on People, Process, and Technology helping individuals & corporates nurture talent, increase employability & efficiency, & develop competencies thereby achieve remarkable results. It is these key differentiators that positions Innate Labs as a preferred knowledge service provider for IT & ITES industry.